In late September 2003 one major project for the 439th Engineering Battalion was the construction of Camp Falcon. The battalion delivered over 100,000 tons of gravel for the roads, and assisted with building the roads, walls, guard towers, and buildings for the Camp. They also finished repairing a compound for the Iraqi Civil Defense Corps, (their equivalent of the National Guard). The unit worked with many Iraqi contractors and vendors who were employed by the Army to help rebuild the country. The water and irrigation systems continued to improve, although much work is still needed and sometimes progress seems slow. By late September 2003 the dining facility had opened. As a result, all of the soldiers could now have a hot breakfast, and a hot supper. Depending on the missions, a lot of days the soldiers actually get three hot meals. The 439th Engineer Battalion also had finished repairing a compound for the Iraqi Civil Defense Corps. They worked with many Iraqi contractors and vendors who were employed by the Army. The Engineers had refurbished a number of buildings within the compound and added a force protection wall on the west side of the compound. Six new barracks were approximately 40% complete and the Engineers had started paving some new roads leading into the camp and also within the camp. The internet cafes had opened so the soldiers now had a more reliable connection to the rest of the world and their families. Unfortunately, the telephone service the soldiers had been using had degraded badly. The Engineers were working on the construction of the Camp Falcon permanent Forward Operating Base (FOB). It was still a few of months until the soldiers would have real barracks with real beds and mattresses, but the buildings were going up. Other projects in the area of water and sewerage are also continuing and the Engineers were doing additional work on the compound for the Iraqi Civil Defense Corps. In December 2003 paratroopers from the 2nd Brigade Combat Team, 82nd Airborne Division began Jumpmaster Refresher Courses, Jumpmaster Pretests and Air Movement Operations Courses at Camp Falcon. The classes were being conducted at the forward operating base in southern Baghdad to prepare the brigade for redeployment and assumption of their mission back at Fort Bragg, NC, early 2004. 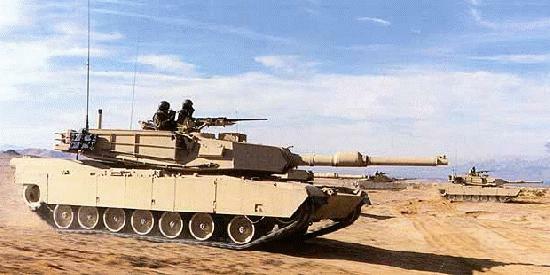 The brigade is part of Task Force 1st Armored Division. The living conditions are slightly better here than they were in Afghanistan. The Army's barracks include a full mess, high-speed Internet access, and Armed Forces television. The 1st Armored Division Artillery accepted authority of the Al Rashid district in southern Baghdad from 2nd Brigade, 82nd Airborne Division, during a transfer of authority ceremony at Camp Falcon, 23 January 2004. The Division Artillery Combat Team looked forward to working with the Iraqi Civil Defense Corps, specifically the 504th battalion and Alpha Company, 36th Battalion, which called Camp Falcon home. In mid-September 2004, as part of an Army-wide effort to give its facilities around Baghdad friendlier connotations, and try to resolve the issue of constantly-changing facility names, Camp Ferrin-Huggins reverted back to its previous name of Camp Falcon, with the Arabic translation "Camp Al-Saqr". By late January 2004 engineers from the 1st Armored Division were midway through an $800 million project to build half a dozen camps for the incoming 1st Cavalry Division. Army planners expected to finish by 15 March 2004. The new outposts, dubbed Enduring Camps, will improve living quarters for soldiers and allow the military to return key infrastructure sites within the Iraqi capital to the emerging government. Plans called for the camps to last between five to 10 years, possibly even longer. Moving to the outskirts of town will allow Iraqi police and the Iraqi Civil Defense Corps to take a lead role in the city's security. At Camp Falcon, on the southern outskirts, a base camp for 5,000 was planned. The 1st Cavalry Division's 5th Brigade Combat Team assumed the mission of securing Baghdad's Al Rashid District from the 1st Armored Division's Division Artillery Combat Team at a transfer-of-authority ceremony 06 April 2004. Col. Stephen Lanza was the 1st Cavalry's 5th Brigade Combat Team, or Red Team, commander. Since arriving in Iraq a year ago, the 1st Armored's DivArty Combat Team had completed a number of different missions. The DIVARTY Combat Team, the 1st Battalion, 94th Field Artillery Regiment, and the 1st Battalion, 4th Air Defense Artillery Regiment, led the force protection package at Baghdad International Airport. Later, the unit set up a counter-battery center to combat the mortar and rocket fire into the airport and 1st Armored's headquarters. In January 2004, they moved to Forward Operating Base Falcon. The 1st Squadron, 1st Cavalry Regiment and Task Force 2nd Battalion, 504th Parachute Infantry Regiment were later added to the DIVARTY Combat Team and assumed responsibility of the city's Al Rashid District. On October 10, 2006, at approximately 10:40 p.m., a 82mm mortar round, fired by militia forces from a residential area in Abu T-Shir, caused a fire at an Ammunition Supply Point (ASP) at FOB Falcon. The ASP, containing tank and artillery rounds, in addition to smaller caliber ammunition, set off a series of large explosions. About 100 troops from the 4th Infantry Division were reported to be stationed at the base at the time, but no injuries were reported. Iraq is a strange place for most Soldiers. From the hot, dry heat to the ever-present dust that settles everywhere. The day in the life of a deployed troop doesn't always include all the right ingredients to make him comfortable, but luckily there are always some things he can do to make himself feel more at home. There sometimes is a special area he goes to enjoy his worldly pastimes. It may be the basketball court, or perhaps the Internet café. Some places of recreation are found in less likely areas. One such area lies outside in a corner of the Headquarters Company barracks next to the 5th Brigade Combat Team headquarters on Camp Ferrin Huggins. An I-beam lies on the cracked asphalt; its edges coated in wax. A dismounted handrail put in place by sandbags stands 10 inches off the ground. The sight might confuse bystanders, until its architects arrive. The sun begins to set and four friends convene with weapons slung as they cling onto wheeled boards before slapping them on the pavement, and this assembly of random objects begins to look more like a crude excuse for a skate park. Previous construction work at the Forward Operating Base Ferrin-Huggins site had been done fast and cheap. 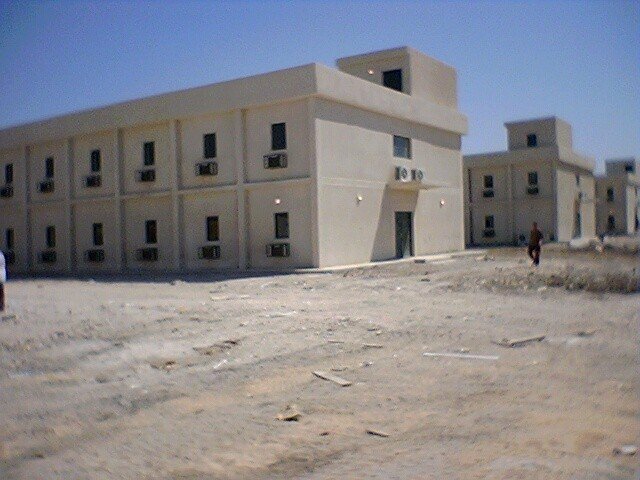 Soldiers later were assigned with the renovation of a series of concrete housing facilities that had been previously hurriedly constructed by the Iraqis. They were constructed so fast, in fact, that the landfill they were built on had not been properly compacted and allowed settlement time. Subsequently, after the buildings went up and weathered the rainy season, the floors gave, breaking all the water systems. The soldiers had to replace those systems and as well as restore the buildings, with Army engineers also providing input to contracting. As of late December 2004, Camp Falcon was also home to a spacious PX. For Thanksgiving 2004, meals were provided for 3,000 by Camp Falcon's canteen and kitchen staff. During their time at Camp Falcon, Assault and Obstacle Platoon of Company B, 8th Engineer Battalion, 1st Cavalry Division has 'enjoyed' much on-the-job training. A prime example is the installation of a sewage system, a task usually taken on by civilians or combat-heavy engineers. “We’ve been working this sewage system for a month,” Bronx, New York, native Staff Sgt. Greg Grady explained. “We are all combat engineers and this is outside of our job description. I just happen to have civilian experience in surveying. We came out here and did it all. We surveyed the land, I drew out the plans.” The sewage pipeline will allow the entire camp access to Baghdad’s main sewage grid, eliminating the need for the current septic tank system, as well as the cost that comes with periodical pumping. With a total of seven weeks work, the pipe system was expected to be complete late January 2005. Camp Falcon uses multilayered defenses with high-walled perimeters and lookout towers to deter any threat. Like any military fortification, however, the gate relies heavily on manpower – U.S. and Iraqi manpower. Soldiers back at Camp Falcon need to be in full uniform and body armor before they leave the company building because of mortar fire.